The Bill aims to stop economic offenders who flee overseas to avoid getting caught in financial frauds or offences. 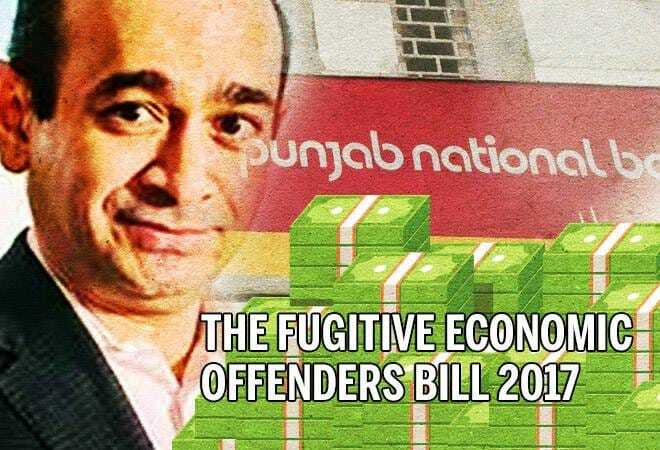 The Bill was first mentioned by Finance Minister Arun Jaitley in his Budget speech in 2017-18 and is applicable for offenders against whom an arrest warrant has been issued for a scheduled offence. Economic offences include those defined under the Indian Penal Code - the Prevention of Corruption Act, the SEBI Act, the Customs Act, the Companies Act, Limited Liability Partnership Act, and the Insolvency and Bankruptcy Code. The proposed law also allows confiscation of the accused's assets and covers cases in which the total value is Rs 100 crore or more. It proposes setting up an independent regulator for auditors. The Bill was introduced in Lok Sabha by Labour Minister Santosh Kumar in December 2017 and aimed at increasing the gratuity limit for private sector from Rs 10 lakh to Rs 20 lakh in line with the government sector. After the implementation of the 7th Central Pay Commission, the ceiling of gratuity amount for central government employees was increased from Rs 10 lakh to Rs 20 lakh. Under the present set-up, employees are paid gratuity if they provide at least five years of continuous service to an organisation when he/she is leaving it. Also, the Payment of Gratuity (Amendment) Bill will allow the government to notify a higher period (26 weeks) of maternity leave as continuous service. This is due to the implementation of the Maternity Benefit (Amendment) Act, 2017 which extended the maternity leave period to 26 weeks from 12 weeks. The Motor Vehicles (Amendment) Bill 2016 was introduced as an attempt to create an exhaustive and comprehensive legislative framework for road safety in India and amends the Motor Vehicles Act, 1988. The Bill has introduced some significant reforms - guidelines to bind State governments in creating a framework for taxicab aggregators, finance insurance to treat the injured and compensate families of the dead in hit-and-run cases, inclusion of Good Samaritan Guidelines, proper electronic surveillance on national and state highways and urban roads and others. The Bill was introduced to repeal the two Acts - State Bank of India (Subsidiary Banks) Act, 1959, and State Bank of Hyderabad Act, 1956. It also seeks to amend the State Bank of India (SBI) Act, 1955 to remove references to subsidiary banks and powers of the SBI to act as an agent of the RBI for subsidiary banks. The Centre had approved the merger of five associate banks - State Bank of Bikaner and Jaipur, State Bank of Hyderabad, State Bank of Travancore, State Bank of Mysore and State Bank of Patiala - along with Bharatiya Mahila Bank with the SBI. The merger had made the State Bank of India one of the 50 biggest banks of the world, increasing its capital base to disburse more loans.